During my radio interview last Friday evening (which, by the way, can be heard here), the subject of bakery buckets came up. 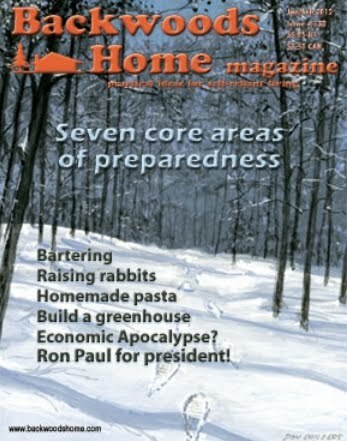 I mentioned such buckets in my BWH article The Seven Core Areas of Preparedness, but only as an aside. In fact, only as a caption on a photo. This was because I assumed everyone knew about bakery buckets. Seems I was wrong. Back in our naïve days of preparing for Y2K, Don and I bit the bullet and bought 24 five-gallon buckets with screw-on gasketed lids. These have been superb buckets and we still use them, but they were expensive. Bakery buckets are a far better deal. Bakery buckets are quite literally a prepper’s best friend. For the last couple of years, I’ve made it a policy to stop at our local grocery store’s bakery department and inquire about buckets. Sometimes there aren’t any available (others beat me to them), sometimes there’s only one or two, and sometimes I hit the jackpot. One time on a happy “jackpot” occasion, I pushed my grocery cart around the store with eight or ten buckets inside, as I finished my shopping. A rather intense woman came up and asked, “Where did you get those buckets?” I replied that I'd gotten them from the bakery department, but apologized that I’d just cleaned out their available supply. “Check back often,” I told her. “They keep them for anyone who wants them.” While nothing was said about the purpose, I got the distinct impression this woman was a novice prepper who was thrilled to find a source for buckets. But watch it – not every bakery is generous. This isn’t a reflection on the bakery staff; it’s usually a company policy. I’ve found both Winco and Costco won’t sell bakery buckets for whatever reason, which is a pity because the bakery departments in both chains must go through buckets like crazy. A slight correction on Winco – they have buckets for sale, but last I checked they were at the exorbitant price of $6 each. That’s nonsense – there’s no reason to spend that much when other bakeries sell them at a fraction of the cost. • They’re pre-cleaned. (Usually.) In my experience, the bakery staff is usually apologetic if the buckets aren't clean, and sometimes they’ll even ask if I can wait for a few minutes while they put the dirty buckets through the industrial washing machine (which takes about five minutes). Whatever was originally in the buckets was likely to be sticky, so having pre-cleaned buckets is a great blessing. On the other hand, the occasional unclean bucket is no big deal; a quick scrub with soap and water will usually suffice. As a note, restaurants also go through many buckets and often sell or give them away – but they’re likely to not be cleaned. Just a head’s up. • Buckets are pest-proof. They guard the contents against moisture, rodents, and insects. This doesn’t excuse you from using Mylar bags, dry ice, oxygen absorbers, or whatever other technique you prefer to keep existing insects from decimating your stored food; but it means outside insect or moisture problems are far less likely. • The volumes are decent. 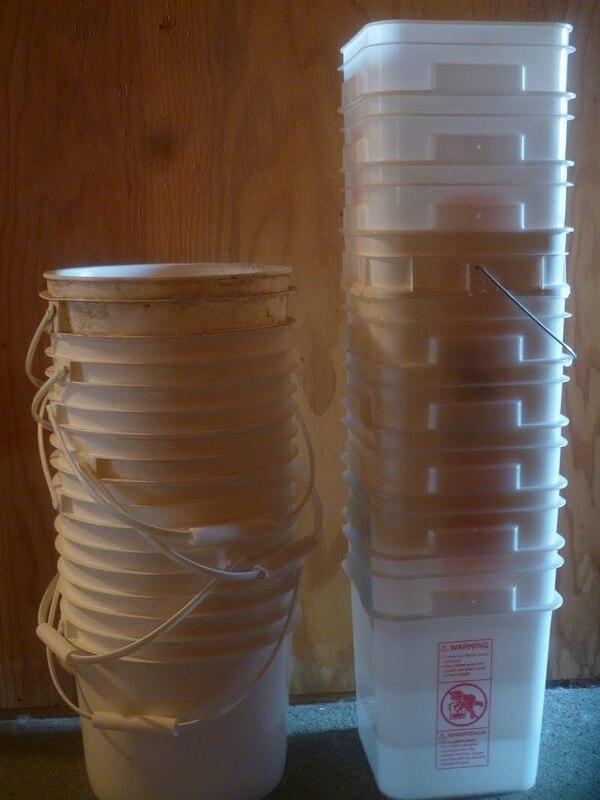 Buckets range from two to five gallons; the average size is 3.5 gallons. A 3.5 gallon bucket holds about 25 pounds of heavier items like rice, beans, flour, powdered milk, sugar, or cornmeal. (Oatmeal is lighter by volume and will hold less by weight.) Five-gallon buckets usually hold about 40 pounds of food. 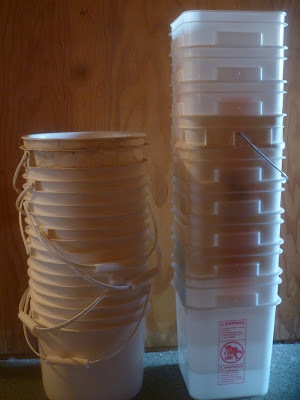 I use two-gallon buckets for storing bulk spices and kitchen aids – pepper, cinnamon, cornstarch, etc. • They store easily. Full buckets are designed to stack on top each other. Empty buckets are designed to nest. Either way, the benefits are obvious. • They’re easy to label and inventory. For labeling, I put masking tape on the top and side with the contents listed in large block letters (always rotate stacked buckets so the tape is facing outward for easy identification). • They store other stuff. Because they’re so readily available, they can be used for any items you want to keep compartmentalized. I have buckets for sewing notions, buckets for yarn, buckets for school supplies, buckets for miscellaneous household items (tape, mousetraps, clothespins), buckets for over-the-counter medicines, buckets for toiletries, buckets for matches, buckets for soap... the list is endless. If the bucket contains dry goods, I put the category (such as “Toiletries”) on the masking tape. Then I tape an index card on the top of the buckets with a detailed list of what’s inside. This way I can add or subtract items as I put new things inside or take things out. I prefer not to use indelible markers to write on the buckets because sometimes the contents change. Tape allows me to label as needed. • Buckets have endless uses. They’re not just for storing food or supplies. On a farm, buckets are most useful if they have handles, which bakery buckets do. We use the larger bakery buckets tucked inside an old tire (so it can’t be pushed over) for water inside livestock pens. Smaller buckets can be used as grain buckets. Even cracked buckets have their uses – while they won’t hold water, they’re fine for grain, salts, or other dry uses. My husband uses buckets in the shop to categorize small tools or hardware such as nails, screws, and other fasteners. We seldom discard a bucket unless it’s broken (in which case the sharp plastic edges can be dangerous). • Charity. My friend Enola Gay has talked about bucketing up pre-packaged charity handouts in the event of hard times. Such charity buckets will hold a respectable amount of food, the contents stay clean and dry; and the bucket can even be used as a stool for sitting. Buckets usually come in either round or square. Use whichever size and style you prefer. My personal preference is to use round buckets for food, square buckets for other stuff. Get a bunch of bucket lid lifters. They’re inexpensive – usually under $5 – and you can keep one wherever you have buckets stored. We have five or six lid lifters scattered around in convenient locations. During the radio interview, one of the hosts mentioned how he found 300 buckets for fifty cents each off Craig's List (they came from a restaurant). What a windfall! He could either fill those 300 buckets himself and have an extraordinarily decent stockpile of food and supplies, or he could keep half for himself and sell the other half. However you look at it, bakery buckets are a phenomenal deal. I urge you to start collecting them today. the bucket in the tire is brilliant! Our alpacas are always knocking their water buckets over! Solution!!! I love buckets for food storage!! None of our local bakeries ever have buckets, people always get to them first. I don't grocery shop often so I lose out. We went ahead and bit the bullet and bought our own with gamma lids, WORTH every dine, IMO I love them for storing dehydrated food I put up over the summer and of course bulk foods. Great post for folks just getting started in food storage!!! I love my buckets! I'm a school cook and I have dibs on all of ours...but I do share. My wife works in a bakery, so buckets are often available to us (she gets them for free.) Another use we found for a taller bucket (35-40 pounder, five gallons?) is as an emergency toilet. I took an old wood toilet seat and cleaned it thoroughly, then attached some wood blocks underneath to keep it from slipping around on the bucket opening. We keep a roll of white plastic kitchen bags and a couple of rolls of toilet paper inside the bucket. You just pull everything out of the bucket, then line it with a bag and do your business. You then tie up the bag and dispose of it wherever. Works great in an emergency! Do you know how many buckets Disney World goes through.?? 4 theme parks plus 20 some hotels with 3 restaurants. I worked there for a year at Hollywood Studios theme park. Just my restaurant tossed out 2 or 3 a day. Someday more. I wish I had been more into prep back then. I get my buckets from the Chinese restaurant in town. Kikkoman soy sauce comes in 5 gal buckets and they barely need to be cleaned. Mrs T, yours is a dilemma with no easy answer, so I'm going to post your question as a separate post and solicit responses. Hopefully someone has a solution for your situation. Some people build furniture out of them! If you built a platform bed that was queen sized, you could fit a couple dozen UNDER it. A "Table" as big as you want... up against a wall in living area.... use say...12 buckets full, ( 3 rows of 4 buckets) top it with a wood top, and drape it with something nice looking, that hides the buckets! Store, stored food in old defective freezers or refrigerators. Their vermin tight, insulated and can be made secure. Great article. Thank you, Patrice! I especially like the "bucket in a tire" idea and will be using it with our critters. One other use. They are amazing for growing food! Portable, and zero weeding. I went to Wal-Mart Superstore today and got 7 buckets with lids, cleaned. I shared, too! "My friend Enola Gay has talked about bucketing up pre-packaged charity handouts in the event of hard times." What a great idea (and I am embarrassed that I had not thought of it myself). Set up a number of "hand out" buckets - they'll make great 3 day (?) bug out buckets -or- hand out buckets. I just recently began to get these buckets from our local grocery store bakery. They were pleased to get rid of them. They had only 2 the day I picked mine up: one clean and one with frosting residue. They even offered to run the dirty one through their dishwasher. The lady said there were several people who picked them up from time to time and to check back when im in the store. I am hoping those folks are prepping too. I am new to the whole concept and for awhile there I think my family thought Id lost it. Slowly but surely I think they are coming around! I love buckets for storage! I just packed up 10 more buckets this weekend. However I bought these buckets from a supplier because local suppliers seem to have gone green on me. By that I mean there are companies that come and recycle all of these for most of the companies in my area and even pay a small price to the bakery for them. Most places I have asked won't sell or given them away. One (occasional) exception is Sam's Club bakery. Sometimes they will give me buckets, but they aren't cleaned and their actual policy is to give them to the recycle company, but if I am nice sometimes they will give me a few. in drywall buckets, deli buckets, Lowe's buckets...my favorite are the 2 or 3 gallon buckets for salt, sugar, and other dry goods that can get heavy in full 5 gallon buckets. I found the small buckets fit perfectly under my sink for a amsll trash bucket(with grocery plastic inside); and one to hold my grocery plastic bags. Us plastics has new economy white FDA approved 5gl buckets for 3.99 plus lids at 1.74. Home depot has gamma seal lids for 6.97. I bought twenty buckets with lids and soft plastic lids for my open in use buckets. Good service. I've only recently discovered the rectangular buckets and thought they would be great for shelf storage (they stack nicely and maximize shelf space), but to my disappointment I've also discovered the lids are not gasketed so they don't seal air tight. I am experimenting with vacuum sealing the round buckets with gasketed lids to see if I might fore go mylar bagging and O2 robbing packets (or maybe not as many). Anon 12:20, if the lids don't fit tightly it may mean either the gaskets are missing, or they're the wrong lids for the buckets (sometimes there are subtle differences unnoticed until you try to fit them). Nothing you can do about it except next time make sure the lids fit before you leave with them. Meanwhile, unlidded buckets have lots of uses, so don't discard them -- you never know when you may need a bucket. I would suggest a rubbery putty (chewing gum consistency). We use wood putty for various purposes, but that wouldn't work for you because it's designed to dry and resemble wood; but I'm sure a rubbery putty of some sort, the kind that doesn't dry and become brittle, would work. You might inquire at your local hardware store and see what's available.